1x speaker, 1xUSB charging cable, 1x manual,1xprotection bag. There is a rubber ring on the plug, it is designed for universal devices and if use on the phone , please take off it with better connection. SUPER DESIGN - This wireless speakers is with brand new unique Stylish design, Enlarge phone volume more than 3 times， line-in "wireless" concept, compact body lets you go anywhere with it. SIMPLE USING - Simple plug into 3.5mm audio jack and turn on speaker, no waiting. 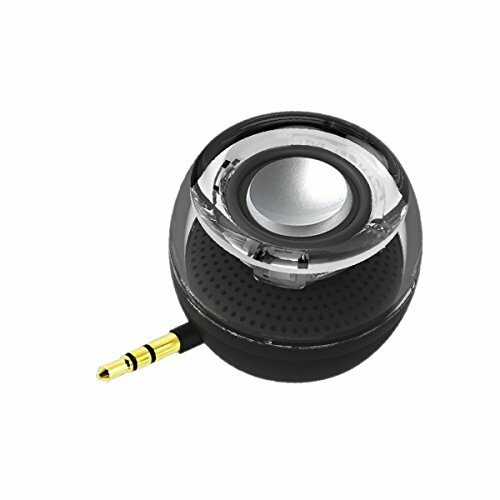 HIGH PERFORMANCE VOICE - Clear loud sound with decent bass,4 times louder portable for extensive uses while you are listening to music, seeing movies, playing games, driving follow GPS, conference calling etc. EASY CARRYING - Small size and light weight to carry, you could put it in pocket, bag, brief case etc, enjoy your music anywhere you go. COMPATABLE FOR - all major devices support 3.5mm audio plug of smart phones, tablets, laptops, PCs, MP3, MP4, PSPs.